If you have encountered an issue and contacted the Helpdesk or onsite technician/engineer, they may request that you download and run a small piece of software that will allow them to remotely control your computer. The software is called TeamViewer QuickSupport and it is an industry standard, secure connection tool that allows a technician the ability to remotely control certain aspects of your computer. 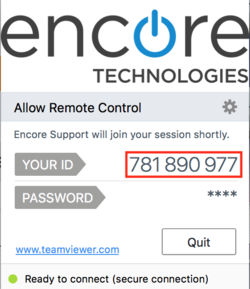 To prevent unwanted access, you must give the technician the 9-digit number displayed in the remote tool before a connection can be made. You can also close the connection at anytime by simply closing the application. It is important to note, please do not leave sensitive information open while receiving support. This can include but isn't limited to banking websites, social media, excel or word documents, etc. The best course of action is to simply close all open applications before engaging remote assistance. The Remote QuickSupport Tool can be downloaded by clicking the link below. QuickSupport is currently unavailable for mobile devices. This page was last edited on 30 October 2018, at 21:16.